Three of the leading organizations in the rapidly growing dodgeball world have come together in a reorganization that will reshape the dodgeball landscape. 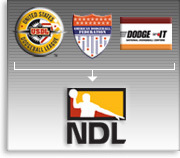 The United States Dodgeball League, The American Dodgeball Federation and Dodge-It Dodgeball Centers, are now moving under the umbrella of one brand with the forming of The National Dodgeball League. This move will allow us to promote one brand instead of three." Said NDL President, Ed Prentiss. "It allows us to combine marketing and administrative resources for the good of one organization instead of several." This move is seen as an important change with the incredible response to the sport of dodgeball. "We just couldn't keep up with the amount of information requests, we didn't have the infrastructure," said Nancy Johnson, membership coordinator, for the newly formed National Dodgeball League's Amateur Association. The Amateur Association's role is to take over the mission of The American Dodgeball Federation and establish chapters for amateur leagues and tournament play nation wide. While Johnson handles the amateur component Prentiss will take on the task of creating the premier professional dodgeball league which was previously the USDL. Prentiss will also oversee the expansion of the National Dodgeball League Dodge-It Centers. We have to see if these centers can be profitable. We are using our first facility in Minneapolis as a test site. Its success will determine if, and when, we role out more centers. In the meantime, the newly formed National Dodgeball League is playing catch up. "This reorganization really affected our time lines," said Johnson. The professional league had been scheduled to kick off with tryouts this fall. Restructuring and creating the new logo designs, website design, and trademark research as well as developing new business systems really set us back. But in the long run this was a smart move. We are getting our house in order and moving forward." added Johnson. Prentiss reaffirmed that catch-up is now the name of the game. "The worse part of the restructuring is all the people we have to get back to. We have thousands of emails that we were tying to respond to while forming the new league - Some date back to July. When the movie broke, it was insane. The ADF, Dodge-It and the USDL all got slammed with phone calls and emails from all over the country. Now, as a single entity, we are in a better position to serve our fans and members as we grow."